Dolce Neve's sign beckons customers inside. Tucked into the heart of downtown Austin, Dolce Neve, located on South First street, is an authentic and artisanal gelato shop founded by Leo Ferrarese, his wife Francesca Silvestrini, and her brother Marco Silvestrini. 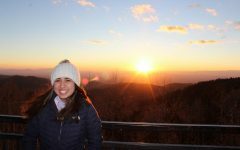 Ms. Silvestrini received proper culinary training in Italy, and along with her Italian fiance, created the comfy gelato cafe known for its exquisite flavors. Originating from their shared love of Italian gelato, the business is a culmination of their passion. After leaving their stable jobs, the three made the decision to open up Dolce Neve together in 2014, and since that day, their success has skyrocketed beyond expectation. Their success has even led to a second location opening in Houston. Open late during the week, this little business is always jam-packed with expectant customers. Dolce Neve’s positive reviews are mostly due to the fact that all of their gelato flavors are handcrafted with organic, locally sourced ingredients. Their gelato is masterfully made just how it’s made in Italy, and all their flavors are made from fresh ingredients from Austin businesses such as G&S Groves and Cowgirl Creamery. This local shop brings authentic Italian flavors to Austin’s eclectic and diverse downtown. I visit the gelateria quite often, almost since they opened, and am always delighted to see what new and breathtaking flavor is in store for me to try out. The ambience of the cafe is cozy, with its somewhat small space, white and pastel colored chairs, rustic white wood counter, and patio designed for comfortable outdoor seating. Succulents sit on little shelves on the walls and the air is fragrant with whatever exciting flavor is being sold that day. Dolce Neve’s interior is appealing and reminiscent of quaint shops in the sun-drenched villages of Italy. The atmosphere perfectly matches that of an inviting family-run business, its doors always open for the public to enjoy their gelato and other frozen delights. Another lovely aspect of the shop is that local art is always hung on the walls, adding to the already welcoming and pleasant interior. The outdoor patio is covered with vines draped on a singular wall, and dark pink tables and chairs are placed along the patio’s entirety. As you enter the shop, you are likely to be greeted by the friendly staff, along with Mr. Ferrarese himself, who is usually found churning gelato as he greets customers. Since there are so many interesting flavors, I am always keen on trying Dolce Neve’s rotational flavors and seasonal tastes, but their staple flavors are outstanding and popular with customers. My absolute go-to flavor, the Goat Cheese and Pecan gelato, makes me question wanting to have a bite of any other flavor ever again. The creaminess of the goat cheese mingles perfectly with the smooth, rich flavor of the pecans, creating a delightful harmony for the taste buds. The flavor has the tangy sweetness of the goat cheese and the chunks of pecan add a contrasting textural element. The flavor is not masked by sickly sweetness, but the flavor profile is beyond complex. At $4.10 for their small, yet spacious cup, you are treated with just enough gelato to satisfy your appetite. Next on the list is the Mascarpone Matcha. The fresh and decadent mascarpone blends with the almost bittersweet matcha. The gelato is a vibrant natural green that has a smooth and velvety consistency. For those who don’t prefer the earthy tones of the matcha, this might not be your choice. However, there is a strong intensity to the taste that is hard to resist. My last pick is the Ricotta, Honey, and Pistachio. The mild flavor of the ricotta blended with the sugary taste of the honey is a complementary sensation in the mouth that exceeds expectations. The ricotta’s texture is thick with large segments of pistachio hidden like treasure in the milky base of the gelato. The addition of the pistachio has a raw, almost penetrating flavor which is balanced by the ricotta and honey duo. Besides offering traditional gelato, Dolce Neve has a wide selection of frozen desserts including granita, chocolate and vanilla gelato bars, gelato sandwiches, and affogatos. Their intensely flavorful espressos are paired best with the sweetness of the gelato. As well, you can purchase custom desserts for special events with the gelato flavors of your choosing. A big plus is that their prices are decent, considering that two full scoops of gelato can be placed inside a small sized cup. 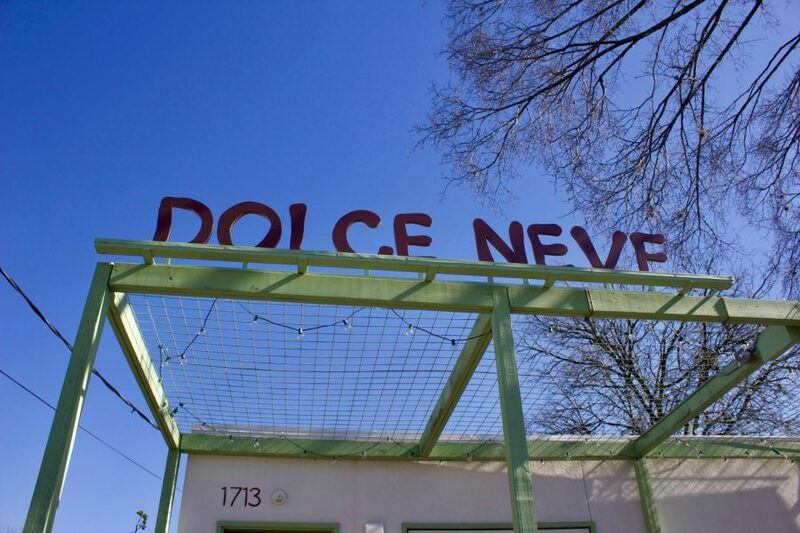 Though Dolce Neve’s classically Italian flavors might not be for everyone, this snug and picturesque gem is a must for locals and anyone who might be passing through Austin. Their well-crafted and special flavors are interesting to explore, and anyone with a hankering for genuine gelato should go downtown to have a bite. The shop’s authentic Italian flavors are a welcome addition to the downtown scene. Sunday- Thursday 12 a.m.-10 p.m., Friday & Saturday 12 p.m.-12 a.m.